NEWS RELEASE 4.13.18 -- Gerald W. Haddock, Tarrant County lawyer, business leader and philanthropist, has been dedicated and passionate about preserving an independent and transparent judiciary his entire legal career. Working alongside renowned jurists, such as, Supreme Court Justice Sandra Day O’Connor and acclaimed international and constitutional expert, Homer Moyer (member, Miller-Chevalier, Washington DC). Haddock has advocated his passion both through his financial support and his teachings in the CEELI institute (physically located in Prague). In 2016 he founded Tarrant Families Matter (“TFM”) to also promote the CEELI ideals in Tarrant County, Texas. While TFM was sold in 2017, Haddock remains committed to preserving and promoting an independent judiciary. In a year when the rule of law has faced challenges across the globe the CEELI Institute’s programs have continued to provide world class training and skills development to legal professionals dedicated to promoting judicial independence, protecting fundamental rights and individual liberties, combatting official corruption, and otherwise strengthening the rule of law. CEELI is reaching more people in more countries, than ever before. Gerald Haddock oversaw the $40 million purchase of office space in Cherry Creek, Colorado, making Crescent Real Estate Equities the biggest owner of office space in the city. The Houston Business Journal highlights Gerald Haddock as he takes over Houston with Crescent Real Estate. In his role as CEO of Crescent Real Estate Equities, Gerald Haddock worked with many people to build a gaming REIT in Las Vegas, profiled here in the Las Vegas Review Journal. The Wall Street Journal realized that Crescent Real Estate Equities was leading the charge for REITs through Gerald Haddock’s leadership. Richard Rainwater counted on Gerald Haddock as part of his team in the early days of Rainwater acquisitions. On Father's Day 2013, the Fort Worth Star Telegram featured Gerald Haddock in a front page article. The article, written by published author and reporter Tim Madigan, describes how Gerald Haddock's passion for art began with his legal backfground, but depicts his family values in the beautiful collection. On May 8, 2013 Gerald Haddock attended a luncheon in Washington DC benefiting the American Cancer Society. There he won a pair of Redskins Quarterback Robert Griffin III's game worn pink cleats. The Washington Post profiled Mr. Haddock and the event. In 1999, Gerald Haddock was one of five Baylor alums to receive the title of Distinguished Alumni. The winter issue of The Baylor Line profiles Mr. Haddock's many accomplishments. Gerald Haddock was awarded a stock-options package while he was CEO of Crescent Real Estate Equities. The L.A. Times noticed this growing trend among real estate executives like Mr. Haddock. Gerald Haddock and his wife, the Hon. Diane Haddock, generously gifted $1 million dollars to Gerald's alma mater Baylor Law School in 1999. In 2005, Meritage Homes Corporation appointed Gerald Haddock to the company's board of directors, noting in this press release his wealth of experience and his expertise. Gerald Haddock currently serves as Chairperson of the Nominating and Corporate Governance Committee, and as a member of the Executive Compensation and Audit Committees for Meritage Homes Corporation. Gerald Haddock’s Beaver Creek, Colorado condominium is highlighted in the book Snow Country for its unique and history inspired décor. Noted as a distinguished graduate of Baylor University, Gerald Haddock is profiled by the Baylor Business Review. 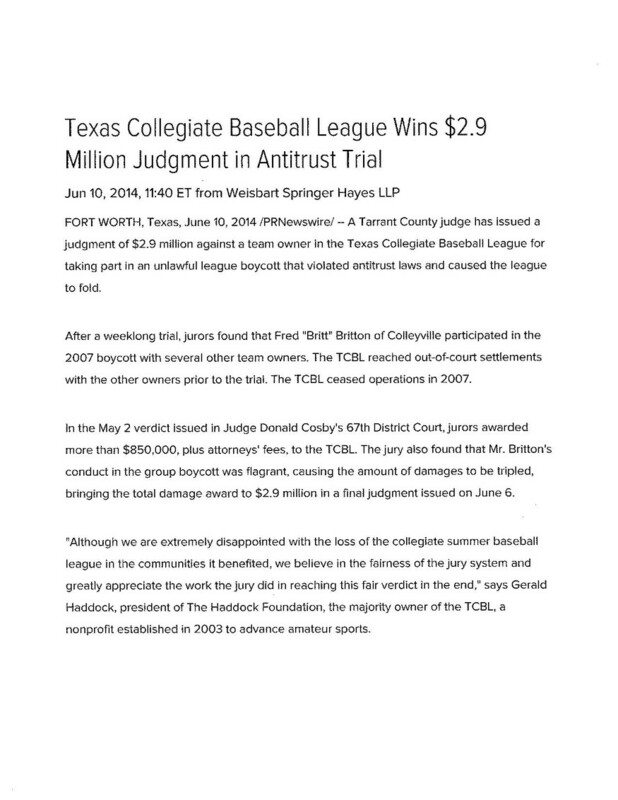 For more than a decade, Gerald Haddock was a minority owner and the general counsel to the Texas Rangers Baseball Club. The Washington Post highlighted the success of Mr. Haddock’s involvement with the club along with former President George W. Bush. Baylor University hosted a banquet in honor of the Baylor Distinguished Alums, including Gerald Haddock. This Business Week article illustrates an example of Herald Haddock’s involvement in high profile transactions with Crescent, in particular with structuring a creative acquisition in Las Vegas to be operated in a REIT format. Gerald Haddock gives a detailed explanation of how REITs have changed over the years in this 1998 article published in the Journal of Accountancy. The Wall Street Journal noted Gerald Haddock’s involvement in changing Wall Street’s perspective on REITs when Crescent decided to create a separate operating company. With Gerald Haddock as President and CEO, Crescent was making a splash in the many areas, particularly Dallas / Fort Worth. Here, he is profiled by D Magazine. In 1997 the Fort Worth Star Telegram (Tarrant Business) covered the growth Crescent Real Estate Equities under the leadership of Gerald Haddock. Can Richard Rainwater Strike a Gusher by Himself? After leaving the Bass family of Fort Worth, Richard Rainwater asked Gerald Haddock to help him build Crescent Real Estate Equities. On behalf of his client, Gerald Haddock filed and obtained a temporary restraining order to prevent Baylor University from destroying the Hughes Dillard Alumni Center in Waco, Texas. Representing his client, Gerald Haddock successfully obtained a mediation order from a federal judge to resolve a dispute between his client and Baylor University. Gerald Haddock is honored to be an Advisory Committee Member to continue to help champion this great cause.